A state-wide mobilizing conference to defend California public education took place at UC Berkeley on Saturday, October 24th. In attendance were representatives from K-12, Community Colleges, CSUs, and the UCs. 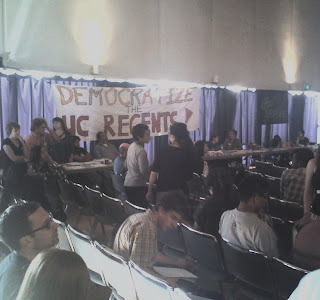 During the general voicing of demands, and in the UC-wide discussion, various people called for restructuring UC governance, including a more democratic Board of Regents. Participants agreed to a state-wide strike and day of action on Thursday, March 4th, 2010.